To ask other readers questions about Fearless in Texas, please sign up. Mel is a headstrong heroine. She goes full force into everything and doesn't back down. Loves fiercely but battles a temper that gets the best of her now and again. I didn't always love how she handled herself but liked her overall. I did like them both. And them as a couple. Seeing them let down their guard and try to stop sniping at each other long enough to actually get things done and find out more about the other. Melanie and Wyatt have been dancing around each other for the last 5 years. Attracted but constantly butting heads and arguing. "Though if she were honest, it was usually her taking the shots and Wyatt deflecting them - but he did have a killer backhand return." Melanie use to be a roping rodeo champion but got sidetracked by a marketing career. She is headstrong, outspoken, and has a very poor brain to mouth filter. Her latest outburst was responsible for the loss of her reputation, job and care Melanie and Wyatt have been dancing around each other for the last 5 years. Attracted but constantly butting heads and arguing. "Though if she were honest, it was usually her taking the shots and Wyatt deflecting them - but he did have a killer backhand return." Melanie use to be a roping rodeo champion but got sidetracked by a marketing career. She is headstrong, outspoken, and has a very poor brain to mouth filter. Her latest outburst was responsible for the loss of her reputation, job and career. Her friends send Wyatt to make sure she doesn’t doing anything else stupid and he ends up offering her a job. He wants her to use her marketing skills to make his newest acquisition, a bar, a successful venture. Wyatt is much more than he appears. He’s not your typical bull fighter. He is not a cowboy hat, jeans and boots guy, preferring ironed dress shirts, dress pants and tasseled loafers. He comes from a wealthy, religious family that he left behind due to their blatant hypocrisies. He has strived to make his life mean something by helping others and giving back. He is well connected. As Wyatt and Melanie spend time together, their attraction goes from smoldering to exploding. I just loved Wyatt. He was a friend to everyone but didn’t feel he was worthy of their friendship in return. He had been in love with Melanie for years but just knew she would never return the feeling, so he "...continued to live off the crumbs she tossed..." and helped her behind the scenes whenever possible. Melanie irritated me at times with her attitude but she eventually figures it all out. The one complaint I have is that the cover model in no way reflects Wyatt’s description. This is the fourth book in the series and another hit. I really enjoy this author's ability to pull out your emotions and get you invested in the characters right from the beginning. I’m already anticipating the next book in the series! Ever so often I’ll stumble on an author that rocks my world. Last summer a new author exploded into my life, when I read Reckless In Texas. I had sworn off authors who wrote about Rodeo, because growing up in that realm, no author I’ve ever read knew what they were writing about. Then I read Kari Lynn Dell’s book and I was catapulted back into my world. She got it and gave it due justice!!!! Now I’m on the 4th book in this series. Fearless In Texas, with it mysterious storyline of a character, wh Ever so often I’ll stumble on an author that rocks my world. Now I’m on the 4th book in this series. Fearless In Texas, with it mysterious storyline of a character, who had been teasing us since the 1st book. Wyatt Darrington, unique to say the least, is quite a character that needed his story told. Wyatt not fitting the norm in the rodeo world, which he resides in as a professional bullfighter, but it actually works for him and his amazing personality. Melanie Brookman, Texas born and arena raised has always just been right there worming her way under his protective reserve and secretive desire. This book has kept me on the edge of my seat from the beginning, scratching my head, tapping my chin, and trying to jog my memory, as to what I missed before. It’s that captivating and mysteriously written. Oh Wyatt, can I just tell you all how much I love Wyatt. He was just so sweet and wanted to save everyone and I was all but what about you! You need someone too. Oh and cowboys! If you had not notice I really like this genre. I do have to mention that since my last one I did actually see a rodeo on tv! Whaaat? Yes it was on this sports channel, but ok so I can read, but watch it, ha, no. To the book! Wyatt is a cutie and we learn so much about him. Melanie used to be a great rodeo roper, but her ca Oh Wyatt, can I just tell you all how much I love Wyatt. He was just so sweet and wanted to save everyone and I was all but what about you! You need someone too. Melanie used to be a great rodeo roper, but her career took more and more time, and she just stopped doing it. And she loved it. Not to mention riding. Poor Melanie, oh you will see. She had a savior complex too, this regarding her little brother (who made me so mad). I liked how it all happened. There was much talking things through and getting to know each other better. It was just these two working through their issues and falling hard. What is there not to enjoy. Five years ago, at their friends Violet and Joe's wedding Wyatt Darrington and Melanie Brookman realised that they had off the charts chemistry, sadly they also both had large intellects and tremendous tempers and realised that any relationship between them would inevitably crash and burn, destroying their relationships with Violet and Joe forever. So they agreed to step back, walk away and never cross that line. And in five years they never have, they goad one another incessantly on the rare oc Five years ago, at their friends Violet and Joe's wedding Wyatt Darrington and Melanie Brookman realised that they had off the charts chemistry, sadly they also both had large intellects and tremendous tempers and realised that any relationship between them would inevitably crash and burn, destroying their relationships with Violet and Joe forever. So they agreed to step back, walk away and never cross that line. And in five years they never have, they goad one another incessantly on the rare occasions they do meet but no more. And since Wyatt threatened to have Mel's kid brother Hank blacklisted in every rodeo in the USA Mel feels more dislike than anything else. Then Mel discovers she has been betrayed in the worst way possible and burns her bridges with gusto, luckily Violet and Joe call Wyatt to help her out - I mean an omniscient billionaire with connections is always handy to have in your back pocket, right? Feeling like she's made a deal with the devil (and possibly endangered her heart) Mel agrees to work for Wyatt in Oregon in return for his help in tracing Hank, who has disappeared without a trace. Wyatt realised a long time ago that it wasn't lust he felt for Melanie, but recent events have meant that he is keeping devastating secrets from her, and lying about it. It's pure torture working with a a woman who lights up his world when he knows at any second that she will discover the truth and leave him forever. Wyatt has been ever-present in the last three novels and really deserved his own HEA. I wasn't sure if Kari could pull this off, so often the greatest characters fall flat in the romance stakes, but I needn't have worried. Wyatt's secret is a doozy and he HAS TO keep it a secret from Mel but ho boy do those sparks fly! "...since the stories keep getting more entertaining, I *know* it'll be worth the wait." And guess what? Dell DID NOT DISAPPOINT! Seriously, this series just gets better and better! I think I'm suffering from a book hangover. Dell delivered another compelling story with characters that are brilliantly brought to life. I'm chomping at the bit for the next installment! Dell excels here and this might be her best yet in this department. (it's a toss up between Melanie/Wyatt and Shawnee/Cole) With Melanie, we have this extremely intuitive gal who makes an art out of reading people. But she isn't so good at turning that talent on herself. With a little help, she does and she isn't all that fired up at what she sees. She does become introspective whenever she's sorting things out so to see her use that introspection on herself, be along with her as she decides on what to change and how to change it and then watch her execute was inspiring. In Wyatt, we have a man who yearns for a connection...a community...a family. Learning his backstory made his behavior and his actions understandable. But it saddened me that despite having the community and family he longed for with Joe and Violet, the Jacobs family, and the rodeo, he still felt like an outsider. Witnessing Melanie give him his heart's desire was...well, heartwarming. Dell has crafted quite a colorful cast and they along with the side plots add depth and complexity to the story. They also make me debate with myself over who I hope to see in the next installment. From Louie and Gordon, Helen and Rowdy, Grace...gosh! There's so many wonderfully drawn characters and then I get to spend time with some whom I've already met as well. *sigh* I love them all. I mentioned this in my review of Tougher in Texas but this I'm mentioning it again because it's worth saying. The Texas Rodeo series is romance but the romance is secondary to the story, in my opinion. I like that Dell has her characters take deeper looks at themselves, consider their mistakes and learn from them, figure out what they want in life and how to go about making that happen. And a common theme seems to be never, ever denying yourself love. I suppose Fearless in Texas had a little different tone since the rodeo wasn't front and center but it was every bit as riveting as its predecessors. Dell wove together a cast of characters I couldn't help by love with a story that kept me captivated. I can't thank Anna enough for turning me on to Dell! Parker continues impressing me with her ability to keep the pace just right and deliver on all the emotions. And for the most part, she keeps her voices distinct. She's become a favorite narrator of mine, honestly. And I'm once again anxious for the next book in the series! Omg I give up this author Kari Lynn Dell keeps making me love each book even more just when I think I can’t love her books even more she does just that!! I don’t know that I’ve ever been blown so away by books as I have been this Rodeo Cowboy series!!! I will love KLD books forever!! I could probably write this review on and on but I won’t!! I do love Melanie and Wyatt and certainly can’t wait till next book by this amazing author Kari Lynn Dell has blown me away!! BLOWN ME AWAY!!! Another great addition to the Texas Rodeo series. Melanie Brookman is what I call a true Texas woman, very independent, tough, has a quick temper, (which isn't a good thing but it often goes with these other traits) smart, loves horses, cattle, rodeos, cowboys and tries like heck to not ever wear her heart on her sleeve. A quick temper lands her in trouble and in the path of Wyatt Darrington that she has tried for five years to avoid. Rodeo bullfighter, Wyatt Darrington, appears to everyone to be Another great addition to the Texas Rodeo series. Melanie Brookman is what I call a true Texas woman, very independent, tough, has a quick temper, (which isn't a good thing but it often goes with these other traits) smart, loves horses, cattle, rodeos, cowboys and tries like heck to not ever wear her heart on her sleeve. A quick temper lands her in trouble and in the path of Wyatt Darrington that she has tried for five years to avoid. Rodeo bullfighter, Wyatt Darrington, appears to everyone to be a man with a perfect life, wealthy, smarter than most, handsome, has everything he wants in life including his dream job. Well almost everything, he hasn't found the woman to share his life with. Growing up in a privileged wealthy family a rodeo cowboy is about the farthest thing from how he was raised could be. He is very much an outsider to the world he's chose to work in and his best friends are part of. Wyatt has been hiding some big secrets from his friends and particularly Melanie. So what was he thinking by offering Melanie to promote his new bar. How will he keep his secrets from her. It is just another instance of Wyatt always going to everyones rescue. Wyatt and Melanie go through so much turmoil to arrive at undeniable passion. The story is a long and torturous one. Saddle up and hang on. Kari Lynn Dell has put a lot of emotion into this one. The series just gets better and better. Don't shortchange yourself, read all of the series. Rodeo written by a knowledgeable professional. Characters with such depth you want to meet them. Best series out there, bar none. Melanie has really messed up with time but dating a client whom she finds out is married. Everyone throws her under the bus but her best friend sends Wyatt to watch out for her. Melanie doesn’t need Wyatt to watch her she wants more, but he is complicated. Wyatt lets Melanie helps with his bar that is failing at the moment. Can these two work together and not fight? These two characters were fun to read about. They each had issues to work out and they work well together. It keeps the readers turn Melanie has really messed up with time but dating a client whom she finds out is married. Everyone throws her under the bus but her best friend sends Wyatt to watch out for her. These two characters were fun to read about. They each had issues to work out and they work well together. It keeps the readers turning the pages. I voluntarily read a copy of this book. The air sizzled during the first few pages of Fearless in Texas as Melanie Brookman and Wyatt Darrington dance at a friend’s wedding. The couple acknowledges their attraction but decides not to give into it. An affair would only lead to complications. Kari Lynn Dell’s descriptive writing and smart dialogue immediately drew me into this superbly written character driven story. Melanie let her temper guide her and as a result her career and her love life has taken a tailspin. She accepts a job offer from Wyatt and leaves Texas for Oregon. There is so much more to Wyatt- he’s not your typical bullfighter. I adored reading about this driven, well connected, complicated man. In exchange for Melanie’s help in reopening his bar, Wyatt has promised to help Melanie find her estranged brother. Wyatt’s promise is a key element in the storyline. The promise draws the couple together and it has the power to tear them apart. The plot choice made the novel a compelling read. Loved that both Melanie and Wyatt were older and had history. Melanie is a fun character—it took me awhile to figure out this feisty, headstrong woman. Melanie’s emotions rule her heart and she misjudges situations; these actions provide insight to her. In contrast, the twice divorced Wyatt appealed to me. Loved Wyatt’s relationship with Grace, Gil, Louie and his dedication to his rodeo clinic. After five years, the sexual attraction between Melanie and Wyatt is still present in every conversation, text and meeting between the couple. The couple tries to keep their feelings in check but eventually passion overwhelms them. Fearless In Texas is a well-paced sensuous read with two dynamic lead characters. Loved the chapter when Wyatt and Melanie hike along the Coyote Ridge trail and are forced to stay overnight in the woods because Wyatt has reinjured his ankle. I could imagine Melanie helping the injured Wyatt out of the ravine, telling him to lean on her and setting up their campsite. The Truth or Dare game they played by the firelight provided interesting insight into both characters. Wyatt correctly guesses Melanie’s fear of the dark. The secondary characters added to the storyline and provided just the right amount of humor and insight. The author balances the storyline by providing insight into the competitive world of rodeo. The author shows through the characters of Melanie and Grace how much practice, determination and strength it takes to compete in this venue. The conclusion of the novel was excellent. The author made several surprising plot and character choices which kept me reading. Melanie Brookman and Wyatt Darrington had last met five years ago while attending a wedding. The air surrounding them crackles with their attraction, and what might have happened if Wyatt had let them, if he didn’t live in Oregon, she in Texas, if it weren’t for her brother Hank … Melanie was a champion roper who drifted into a mar What a wonderful feeling to discover an author who charms you with her exquisite writing, her outstanding storytelling abilities, and utterly unforgettable characters! Melanie Brookman and Wyatt Darrington had last met five years ago while attending a wedding. The air surrounding them crackles with their attraction, and what might have happened if Wyatt had let them, if he didn’t live in Oregon, she in Texas, if it weren’t for her brother Hank … Melanie was a champion roper who drifted into a marketing career, and doing right by her brother Hank has defined the paths she has chosen all her life. She is fierce, driven, and when her legendary temper gets the best of her, Wyatt offers her a temporary job in exchange for providing her with answers as to Hank’s whereabouts. Wyatt is a fabulous hero: he is pushing forty, a golden boy who has succeeded at almost everything he does, except his personal life, and his backstory was unlike any I have read before. He exudes charm, yet he is a man of few words who has a tendency to retreat into himself when cornered. He is burdened by secrets, and stuck in all sorts of convoluted relationships. Melanie must have been a very difficult heroine to write; a touch more and she would have been unpleasant, but Ms. Dell’s mastery made it so that she wasn’t. Melanie is incredibly real, flawed, and ever so relatable with her short fuse and sharp tongue; she is also somewhat older than we are used to: she is thirty four. What amazed me almost immediately was the exceptional quality of the writing: Ms. Dell’s uniquely descriptive voice bring every setting into sharp focus: I could see that blue sky, the chill in the air, the rodeo life, the animals, images crystal-clear in my mind. The dialogues seem to originate naturally from the characters themselves, seemingly without any outside intervention. Every word was perfect, every sentence enchanting, every paragraph riveting; the whole narrative infused with intelligence and genuine emotion. FEARLESS IN TEXAS is as intricately crafted as the best murder mystery, with a plot twist towards the end I never expected. It was a very daring move from the author, whom I applaud for this realistic turn of event. FEARLESS IN TEXAS is such relief from the banality of most contemporary romances these days. Although it is book four in the Texas Rodeo series, as you can see, it stands perfectly on its own, but when I think at what I missed prior to FEARLESS IN TEXAS, I could just cry! And to say that I cannot wait for the next book in this series would be a major understatement, because it will be epic! As an infant all the way through her young adult life she lived the horse woman’s life. Then working for Jacobs Livestock. Before moving on to college to become a marketing for the good old boy network. Who thought they could treat her l This was a story of friendship, family, and love. But with a host of errors and secrets to keep you on your toes. We have Melanie Brookman the daughter of world famous and most respected tie-down roper and horseman, on the professional circuit, Johnny Brookman. The final straw coming when she knew she was giving up all her precious time and once again having to cancel dinner plans amongst other things to stay to work. But when her boss pawned her off on a client. When after several meetings being single adults they start seeing each other she finds her boss holding it over her head, her so-called affair with him. This is the fourth book in the series - and I have to admit the first that I have read. I did not feel the lack of the previous books, but I am also sure that I would have understood some of the other relationships better if I had. I may also have known Wyatt and Melanie's natures sooner. I have added them to my tbr pile, so that I can catch up. The suspense or twist in this book is all based around one event, which has lasting ramifications. It is a while until we find out what it is, and also why it is such a big issue. I love how Mel reacts and how she rationalises everything. As we get to know more about Mel and Wyatt, we can see how suited to each other they could be. As they allow themselves to enjoy each other physically, but continue to hold back on their feelings, it is incredibly frustrating - but Ms Dell ensures we know just how they both really feel! 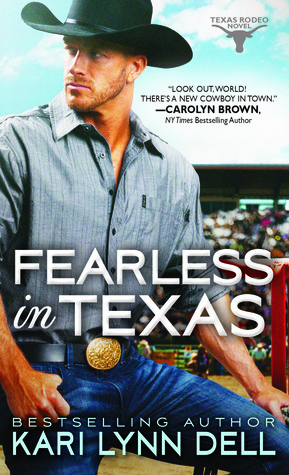 Fearless in Texas is just as good a book as the first three in the Texas Rodeo series. This is Wyatt and Melanie's story and it was a fun one to read. This book can be read without reading the other books in the series but I think it is better if you have read the first three. In the past books I didn't dislike Wyatt, but I found him a little bit off putting. He is someone who seemed to think he always knew best and he didn't care if you disagreed with him, he'd just manipulate the situation unt Fearless in Texas is just as good a book as the first three in the Texas Rodeo series. This is Wyatt and Melanie's story and it was a fun one to read. In the past books I didn't dislike Wyatt, but I found him a little bit off putting. He is someone who seemed to think he always knew best and he didn't care if you disagreed with him, he'd just manipulate the situation until it turned out the way he wanted it. In this book, he is much more likable. He is not really someone who sees himself as infallible in his judgement, as much as someone who cares deeply for the people around him and is unable to stop himself from trying to help if he can. Melanie is likable from the past books and is very likable in this book too. She is someone who has worked hard for her success and keeps driving herself, even when she is unsure that it is all worth it in the end. She has spirit and cares deeply for her family and friends as well. I enjoyed the relationship development between the characters and I loved the secondary characters as well. I'm really looking forward to the next book in the series. I would recommend this book to anyone who enjoys romance. I carried this book around for several months before reading it, because I hadn't read the previous book, and I knew I had to read them in order. When I finally was able to read this book, I wasn't disappointed, once again I was drawn into rodeo life. I was there, I could see the pain, love, and smell the smells of rodeo. Only a person with a passion for rodeo, can make you feel that way, and Kari Lynn Dell didn't disappoint me. I was drawn into this story and was upset that I couldn't read unti I carried this book around for several months before reading it, because I hadn't read the previous book, and I knew I had to read them in order. When I finally was able to read this book, I wasn't disappointed, once again I was drawn into rodeo life. I was there, I could see the pain, love, and smell the smells of rodeo. Only a person with a passion for rodeo, can make you feel that way, and Kari Lynn Dell didn't disappoint me. I was drawn into this story and was upset that I couldn't read until I was done. I learned not to start an awesome book when you are moving from one state to another. I kept wondering what my new friends were doing, and if they were okay. Angry and empowered is one thing. Destructive and vindictive is another. Unfortunately, while I wanted to connect with this story, I struggled with the beginning of the story, and I thought it was too focused on Melanie and the man she was, unknowingly, having an affair with. I can't help but be Melanie's champion. It seems that everyone thinks that she shouldn't have deep feelings and show them. She would probably explode if she kept them in. It is true what they say about true friends, her's stuck by her when it got tough. Wyatt is trying to be one of those friends, Melanie doesn't make it easy for him. It was a long process getting from enemies to lovers for them. From the moment I started reading the advance reader copy of this title that I'd requested, I was totally at sea, and remained that way for the most of the novel. I'd obviously missed the notation at the end of the blurb that this novel was the fourth in a series, and because of that, for most of the novel, I had no idea what was going one or why. My issues all started Melanie, the heroine, who finds out too late that she's in an affair with a married man, and that her boss knew all about it, se From the moment I started reading the advance reader copy of this title that I'd requested, I was totally at sea, and remained that way for the most of the novel. I'd obviously missed the notation at the end of the blurb that this novel was the fourth in a series, and because of that, for most of the novel, I had no idea what was going one or why. My issues all started Melanie, the heroine, who finds out too late that she's in an affair with a married man, and that her boss knew all about it, set her up, and said nothing. I was in her corner until she pulled the idiotic and spiteful stunt that cost her her hard-earned career. I didn't understand her previous willingness to be trod upon by her smarmy boss, and once she'd tanked her job and fled to the ranch with Wyatt, I was utterly clueless about what the familial relationships were among the entire cast of characters. When I next encountered the mysterious animosity/attraction between Melanie and Wyatt, one that had been going on for years, I didn't understand that either, nor did I understand the reasons why Wyatt attached himself to this particular family like grim death. Add to that the secrets, the lies, the spite, the bitchy low blows, and the love/hate relationship between the Melanie and Wyatt, the two main characters, who have been clearly attracted to one another for years but have left that attraction on the back burner, the reasons for which may have been mentioned in previous novels in this series, which I'd not read. Also there are the issues with Melanie's missing brother, Hank, not to mention the secret child who shows up more than halfway through the novel, or the fact that this novel takes place in Oregon, not Texas as the title suggests, and the fact that we learn that Wyatt is a bullfighter, not a cowboy, as pictured on the cover, and I found myself desperately wanting to close my Kindle and walk away, but I stuck it out to the end, and because of all the aforementioned issues, I still could not give this confusing and slow moving novel more than a 2.5-star rating. While I'll admit that some of my issues stem from not realizing I was entering a series nearly at its end, I also had problems with the cover photo (again, Wyatt isn't a cowboy and can't even ride a horse using a Western saddle), and while I liked Wyatt and admired his commitment to helping others, I really had zero patience for Melanie. I found her behavior childish, her personality irritating and downright bitchy, and, aside from her looks, I simply couldn't understand what Wyatt found to like about her. While this novel isn't badly written, it desperately needed a prologue or at least a "family" tree for the uninitiated newcomers to this series, because trying to figure out who was who, what their relationships were, and how Wyatt even latched onto his family took way too much time and energy, and by the time I figured it out, I simply no longer cared. If you're new to this series, I strongly suggest that you start at the beginning, or you may end up as lost and frustrated by his novel as I was. Wyatt and Melanie have been on the edges of the Texas Rodeo series for some time now, Wyatt from the start. Finally, in Fearless in Texas we get their complete story and yeah, it’s complicated. Wyatt is a quiet man, a man more likely to be on the fringe of things not pushing his way to the front, a man of secrets and, at times, a keeper of others’ secrets as well. Melanie is hot tempered and not afraid to speak her mind – which often and currently has gotten her into some very hot water. While Wyatt has been attracted to Melanie for years but kept his distance and silence, Melanie is slower to get to that point but when she does she is a power to contend with. There are unexpected twists and turns in Fearless in Texas. Some that I suspected, others that came out of left field for me. But that’s okay, life is never easy and smooth it’s usually more like a lake with the wind whipping up choppy waters. There are answers to questions in Wyatt and Melanie’s story but since there is another story to come around Christmas time – I’m hoping that we still have some surprises in store for us. I liked this couple and it was fun to run into other old friends as well. I suppose you “could” read Fearless in Texas on its own, but there are a few threads woven throughout the series that I believe makes this a more enjoyable, complete reading experience if you’ve read from the start… but that’s my opinion. I would easily recommend this story and the entire series to any Contemporary Romance reader who enjoys a tight plot, a look into the behind the scenes of the rodeo world, interesting characters and just some really good stories. Kari Lynn Dell just keeps getting better with each book, I cannot wait to see where she takes us next. Check out our Fearless in Texas post on Wicked Reads. The suspense or twist in this book is Check out our Fearless in Texas post on Wicked Reads. By now, everyone knows that Keri Lynn Dell’s Texas Rodeo series is one of my all-time favorites. This was my favorite series of 2017. How do I go up from there? Do I even need to? Is this book actually better than the previous three? Yes. It is. Not because the previous books weren’t all 5 Star dream reads, but because of a kind of...hummm...maturity, I guess. Ms. Dell is progressing from being a really good writer and storyteller into something more...capturing and portraying emotional longing By now, everyone knows that Keri Lynn Dell’s Texas Rodeo series is one of my all-time favorites. This was my favorite series of 2017. How do I go up from there? Do I even need to? Is this book actually better than the previous three? Yes. It is. Not because the previous books weren’t all 5 Star dream reads, but because of a kind of...hummm...maturity, I guess. Ms. Dell is progressing from being a really good writer and storyteller into something more...capturing and portraying emotional longing at a deeper level. Wyatt Darrington swept me right off my feet. As Violet’s friend, I hadn’t given Melanie more than a passing thought in the previous books. She just didn’t jump out of the pages for me. Wyatt, on the other hand, was my favorite secondary character from book one! Not only is he Joe’s best friend and bullfighting partner, he has always been a good and helpful man to everyone who needs help. I adored him, so I was particularly excited when I got a whole book featuring him. I was a little surprised about the deep connection between Wyatt and Melanie. Melanie carries a lot of baggage, and even more at the beginning of this story. Sheesh. Her life is a total mess and she just continues to make things worse. I wanted to shake her by the scruff of her neck. Then, in steps Wyatt to save the day. He’s so sweet! Have I mentioned that I adore Wyatt? A few times. Okay, then. It turns out that Wyatt had a big crush on Melanie for years. Sigh. There goes my man. Dang. ARC graciously provided by Sourcebook and NetGalley for an honest and voluntary review. It’s always great fun to dig into a cowboy rodeo romance, and Keri Lynn Dell writes some of the best. Add to that the phenomenal editing and practically perfect finished product from Sourcebook Casablanca, and this book is a delight to read in every aspect. I've been a fan of this author since I read the first book in this series, so I was excited to get an advance copy of this one to read. It was great to catch up with familiar characters from the previous books and finally read Melanie and Wya It’s always great fun to dig into a cowboy rodeo romance, and Keri Lynn Dell writes some of the best. Add to that the phenomenal editing and practically perfect finished product from Sourcebook Casablanca, and this book is a delight to read in every aspect. I've been a fan of this author since I read the first book in this series, so I was excited to get an advance copy of this one to read. It was great to catch up with familiar characters from the previous books and finally read Melanie and Wyatt’s story. After leaving her PR/marketing job with a bang, Melanie still needs to make money while she decides what to do next. She and Wyatt have had sizzling chemistry since day one, but neither have acted on it in order to avoid complications with their mutual friends should things not work out. When Wyatt offers her a job promoting the bar he purchased and giving it a makeover, Melanie fully intends to keep things professional. She’s probably better off that way, because if she ever learns the secret he’s keeping, it’s an easy bet that she’ll never forgive him. This was such a phenomenal read! From the well-meaning, interfering friends, to the charming, quirky small-town characters, and Wyatt and Melanie trying to pretend that they hadn’t been in love with each other for the past five years, every step of their journey was endearing and entertaining. Wyatt and Melanie were very realistic, each with their own flaws, and they worked to improve themselves while still helping each other. I loved every part of their story and wholeheartedly recommend this book as well as the others in the series! When I saw that this book was going on tour, I knew I had to get on board. I’d read and enjoyed the first two books in the series. I went into this book thinking it was book three…. oops! A couple chapters in, something was mentioned and I suddenly realized I was missing something. This is book four in the series. It does stand alone, but there will be these random moments where you’ll want more information that can be found in the prior books. Wyatt has been a secondary character in this series since book one. I know that I was intrigued and want to know more about Wyatt. He’s been shrouded in mystery and I couldn’t wait for him to finally get his story and find love. And enter Melanie. I’ll admit, that if she was in the prior books (that I’ve read), I didn’t remember her. But this book starts with a prologue that is pretty much Wyatt and Melanie’s meeting at a wedding of mutual friends and sparks are flying. But because of those mutual friends, they decide not to act on those sparks. Fast forward a couple years, and they’re thrown together. Both Wyatt and Melanie are headstrong and therefore they dance around each other. It was quite the interesting dance. Both also had some major issues they had to overcome in order to allow themselves to have their happily ever after. Ms Dell took me on a roller coaster ride filled with laughter and even a couple tears. Kari was a new author's book I was given Tougher in Texas first, I have an OCD problem If someone gives me a book I have to look up the author and make sure it is a stand alone or if it is a series I have to read the first one FIRST!!!! SO YES I WOUD RECOMMEND THI Kari was a new author's book I was given Tougher in Texas first, I have an OCD problem If someone gives me a book I have to look up the author and make sure it is a stand alone or if it is a series I have to read the first one FIRST!!!! SO YES I WOUD RECOMMEND THIS SERIES TO YOU!!!!!! We met Wyatt Darrington in the previous books about the Texas Rodeo but this time instead of trying to corral a mean bull, he is taking on Melanie Brookman and her temper. She has a way with dealing with cheaters that becomes quite famous. Can Wyatt handle Melanie even with his secrets. This is a great read and funny enough to make it very enjoyable but romantic enough for all of us. Overall, I liked this but to be fair there was a little too much Hank/Grace in this story when it’s supposed to be about Wyatt/Melanie. Even if Hank is Melanie’s brother, his inclusion within the storyline shouldn’t have been at the expense of Wyatt/Melanie’s relationship development arc. Another great one! Melanie and Wyatt were great together! Really enjoyed it! Kari Lynn Dell is a native of north central Montana, a third generation ranch-raised cowgirl, horse trainer and rodeo competitor, most recently the 2017 Canadian Senior Pro Rodeo Breakaway Roping season champion. She attended her first rodeo at two weeks old and has existed in a state of horse-induced poverty ever since. She currently resides on the family ranch on the Blackfeet Reservation, loite Kari Lynn Dell is a native of north central Montana, a third generation ranch-raised cowgirl, horse trainer and rodeo competitor, most recently the 2017 Canadian Senior Pro Rodeo Breakaway Roping season champion. She attended her first rodeo at two weeks old and has existed in a state of horse-induced poverty ever since. She currently resides on the family ranch on the Blackfeet Reservation, loitering in her parents’ bunkhouse along with her husband, son and Max and Spike the Cowdogs, with a tipi on the front step, a view of Glacier National Park from her writing desk and Canada within spitting distance.